Imagine the possibilities. 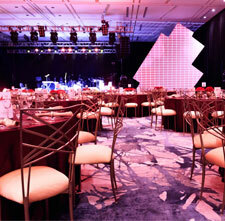 More than 16,370 square feet of stunning event space to host up to 1,500 guests. Two lavish ballrooms, one at over 10,700 square feet, can be combined for elegant affairs or conveniently divided into twenty distinctive breakout rooms. Our dramatic oceanfront terrace hosts cocktail receptions for up to 600, with views of the Sea of Cortez. 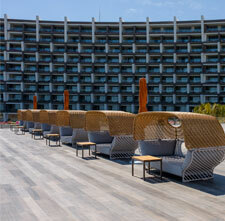 Grand Velas Los Cabos is the premier Cabo San Lucas event space for inspired affairs. As one of the largest and most functional event spaces in the region, Grand Velas Los Cabos Convention Center is the premier destination for meetings and conventions of all sizes. Two opulent ballrooms can be artfully arranged to accommodate up to 1,042 guests for a cocktail reception, or divided into 12 spacious breakout rooms. The Ambassador area can be divided into six distinctive meeting spaces for 70 guests each, or opened to host 477 for a cocktail reception. Two private meeting rooms are also available for ancillary events. Open foyers and floor-to-ceiling windows create a spacious feel and offer spectacular views. Surround your event in panoramic views from our stunning oceanfront terrace. Designed to meld seamlessly with the natural surroundings, the Terraza del Mar is the largest, most spectacular terrace available along the Los Cabos coast. Over 10,000 sq. ft. of open air space can accommodate up to 600 guests. Experience refreshing sea breezes while enjoying delectable fare and tropical cocktails under starlit skies. Our expert meeting and event planners can help you craft a truly unforgettable affair in this stunning outdoor venue.